To say we love Yellowstone is an understatement. 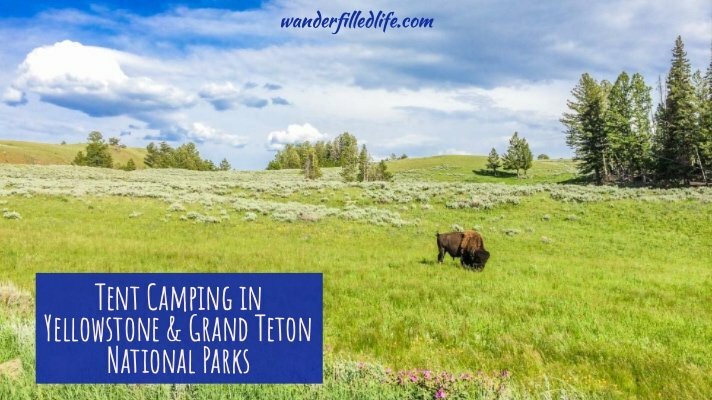 While we took this trip to visit national parks sites we haven’t been to yet, we really just wanted to get back to Yellowstone and Grand Teton national parks and do some more tent camping. Additionally, we really enjoyed staying in Cody, WY, a small town on the east side of Yellowstone. We stopped in Cody on first trip out West back in 2009 and we wanted to spend more time here this time around. Plus, we knew we were going to be in Yellowstone and Grand Teton for a week or so and we needed supplies. Cody is a great place to stock up before heading into the parks! Cody is relatively small in general terms (about 10,000 people), but a lot bigger than many other “towns” out this way. The town is about an hour east of the east entrance to Yellowstone NP. The city is named after Buffalo Bill (William Cody) and we visited the rather large Buffalo Bill Museum on our last trip. 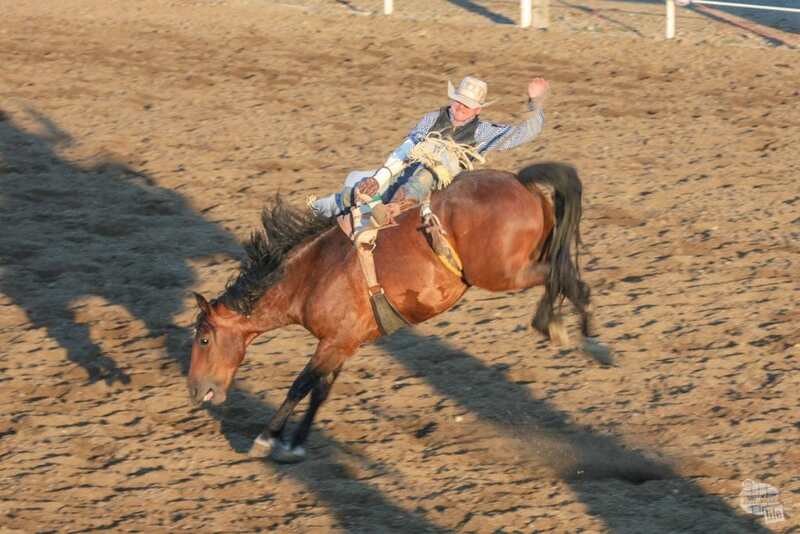 Another interesting tidbit about Cody is that they have a rodeo every night during the summer, with a “special” Cody Stampede the first few days of July, terminating with the Fourth of July festivities. We spent two nights here, staying at the Ponderosa Campground. Their tent sites are in a large grassy area right along the road. We liked the campground well enough and stayed there again in 2017. On the second night, we made a point to hit the rodeo, which was outstanding! For more information on Cody, be sure to check out our article from our longer visit in 2017. The first major hurdle when it comes to spending time in Yellowstone is where to stay. 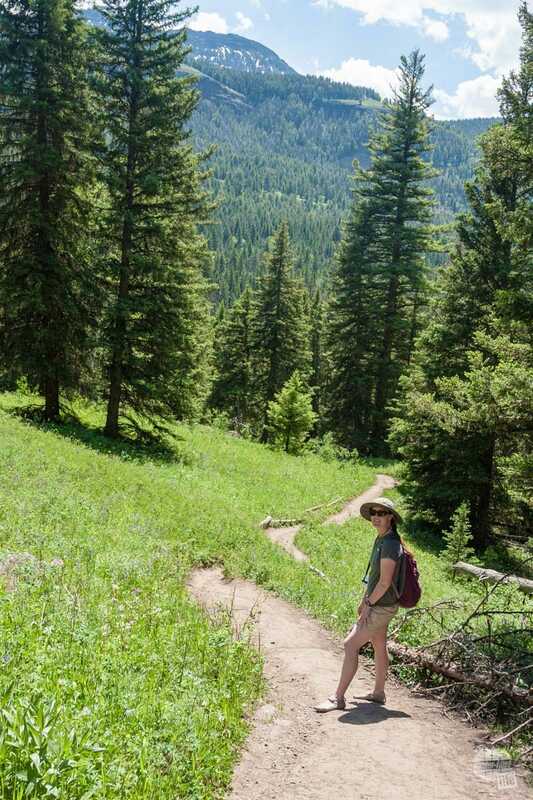 Previously, we have stayed in Grant Village and Canyon and liked both campgrounds. (In 2017, we stayed in the Fishing Bridge RV Campground). We like staying in campgrounds with showers. We like to hike so having a shower to get clean after a day or two is important to us. Both Canyon and Grant Village have showers, so we tried to get reservations for either of those spots. 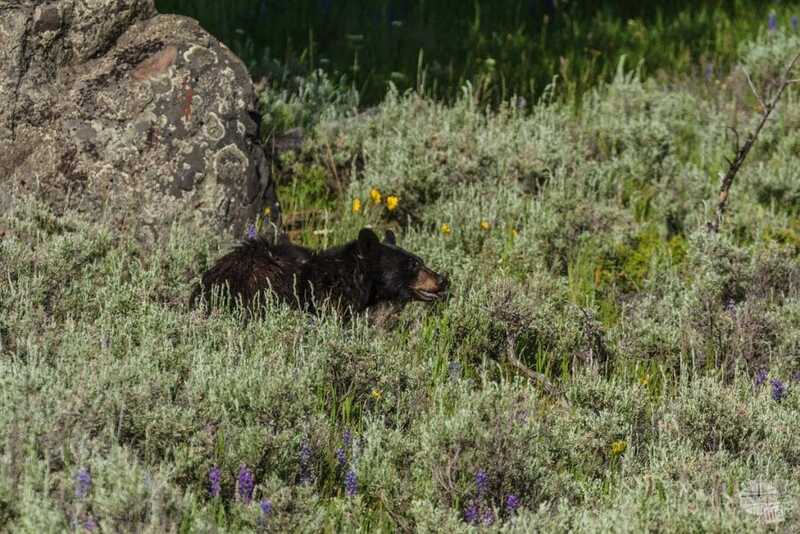 Grant out taking pictures of a black bear along Blacktail Plateau Drive. The best we could get booking a few days in advance was Bridge Bay. While there are no showers at Bridge Bay, it is not too far from Fishing Bridge, which does have showers. 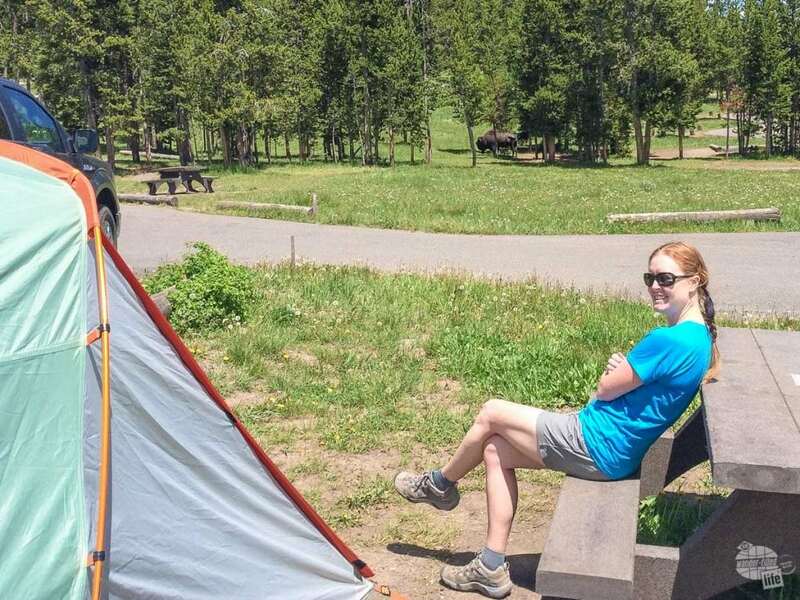 There are plenty of other campgrounds in Yellowstone which are a lot more spartan and do not take reservations but we like having our amenities especially if we are camping and hiking for several days. We were not fans of Bridge Bay. Our site was not level, there was not a lot in the way of trees and it seemed to be full of what I would term as “amateur” campers. Our campsite in Bridge Bay. 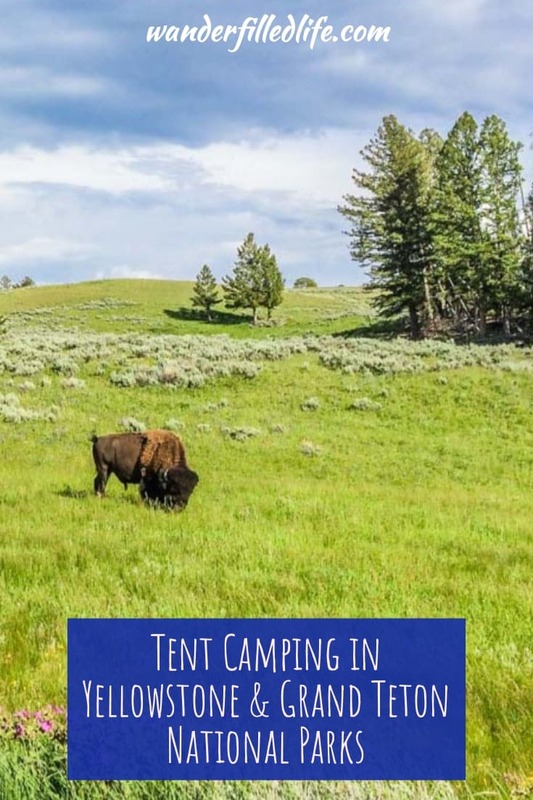 If you look in the trees, you will see a bison… Just one of the hazards of camping in Yellowstone. 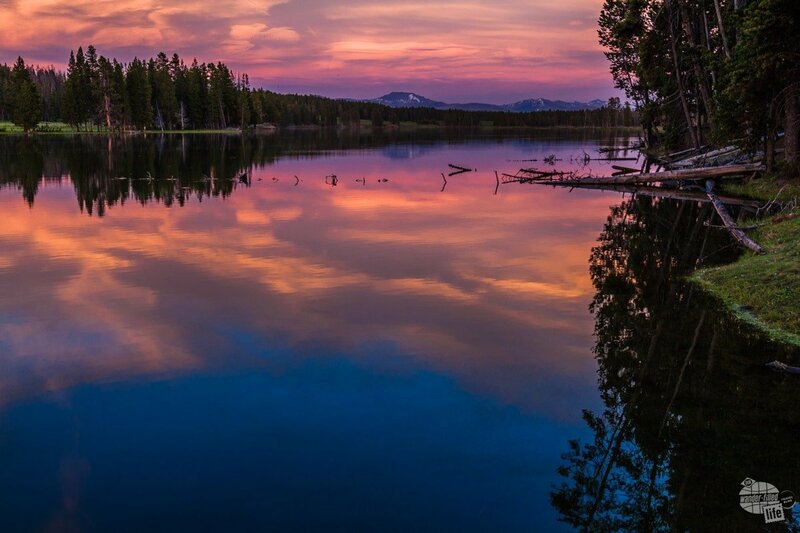 There’s a certain etiquette that comes with camping… an understanding that everyone around is sleeping in tents so don’t make a lot of noise after dark; don’t walk through other folks’ campsites and don’t hog the bathrooms. I can’t count how many times someone tripped over the guy lines of our tent on their way to the restroom or set off their car alarm. We haven’t run into that before in other national parks campgrounds. All that said, a lot of that ended after the holiday weekend ended. 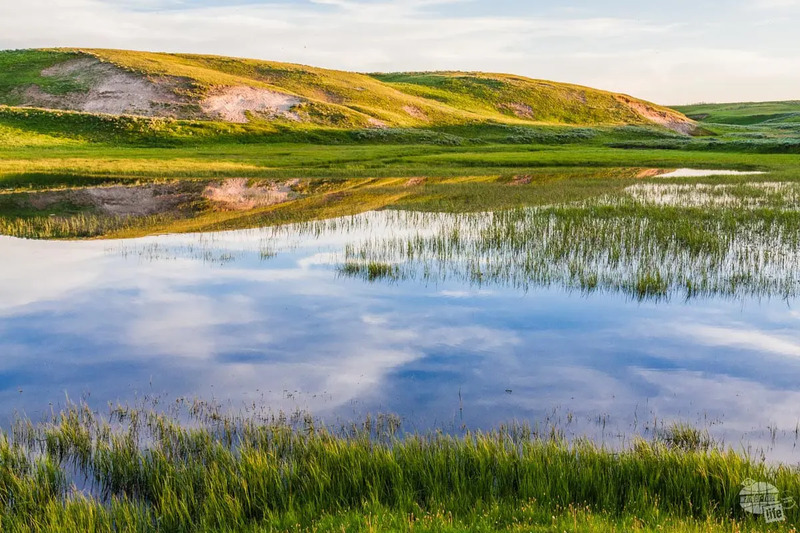 Pro Tip: As much as we love not making reservations and keeping our itinerary loose, we should have made a reservation in advance for Yellowstone. Initially, we planned to hike this afternoon, but some very large, dark clouds changed our minds. Instead, we ended up driving the “big loop” around the park. For folks who have never been out West, the size of Yellowstone is hard to comprehend. Yellowstone is larger than Rhode Island or Delaware. 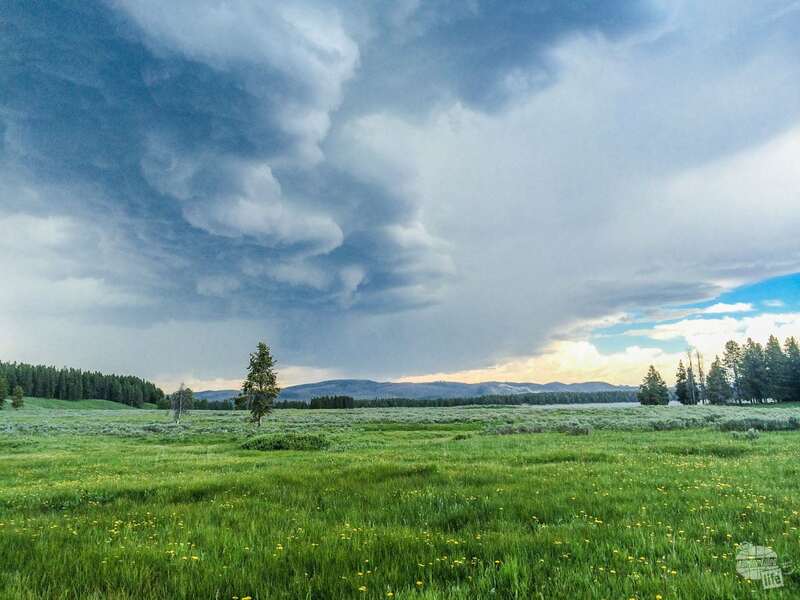 A storm rolling into Yellowstone National Park. It took about nine hours to drive the loop around the park. That included a few quick stops for museums and sites, a sit down dinner, and of course a few stops to watch and take pictures of critters. We saw buffalo (finally! ), elk, deer, two marmots, a black bear, a coyote, and a wolf (barely, through binoculars). We visited a museum that we had never stopped at before on the history of the park ranger. It was fairly small, but very interesting. The guy manning the museum today was a retired ranger who had worked at several NPS sites, including Katmai NP and Gates of the Arctic NP in Alaska. It was neat to talk to him and get some more information on the rangers and their job. Interestingly, the government didn’t establish park rangers until several years after the park service. Before then, civilians ran the sites. Another highlight of the day was eating dinner at the Roosevelt Lodge. We really enjoyed the ambiance of the restaurant and the food was delicious! The only other time we’ve eaten in a lodge was when we came snowmobiling in February 2012. 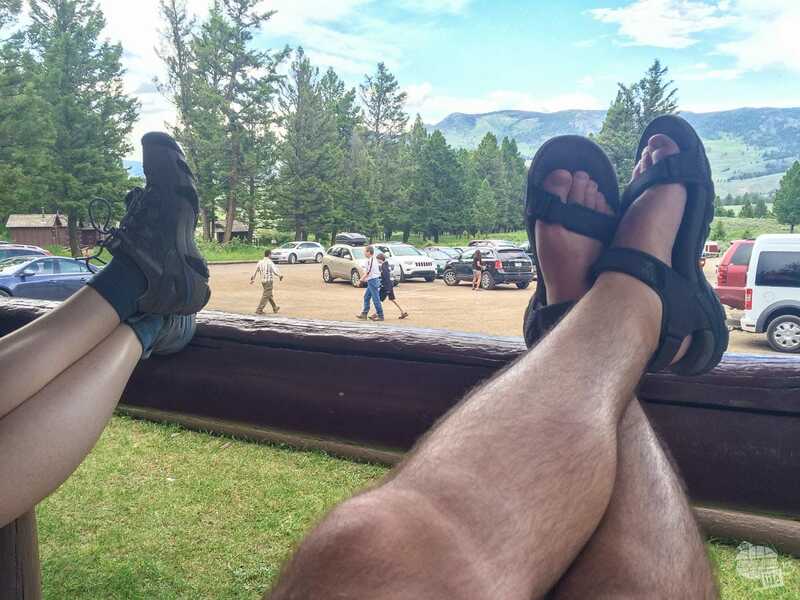 The food at the lodges has been great every time, and they always have grass-fed beef and bison on the menu, and usually other game meat, such as elk or antelope. We awoke after a cold night to a very pleasant morning on the Fourth of July and, again, we won’t see any fireworks today. Shoshone Lake peeking through the trees. 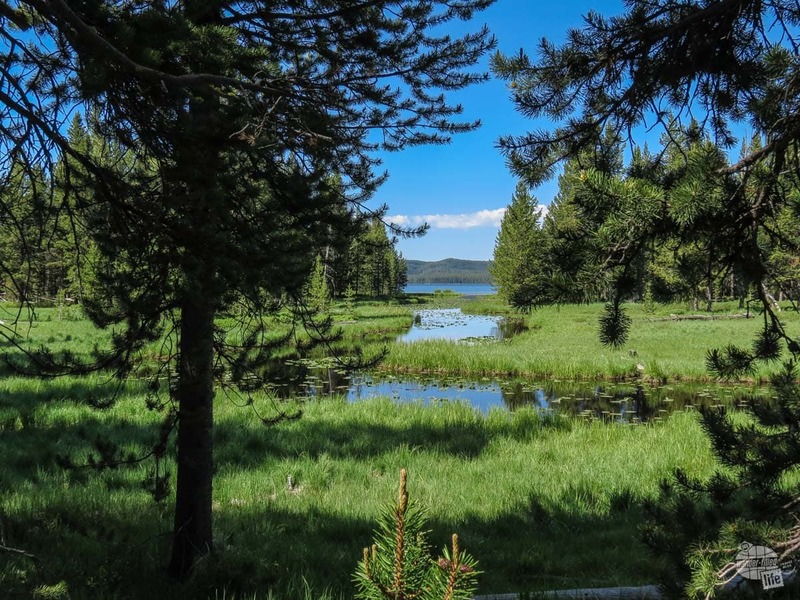 We hiked to Shoshone Lake, which is not far from Old Faithful. The six-mile hike down was very pleasant and quiet! The lake is the largest lake in the US that does not have a road leading to it. When you look at it on the map, it doesn’t look that big, but that is because the map covers so much area! We hoped to see some moose in the hike, but we only (!) 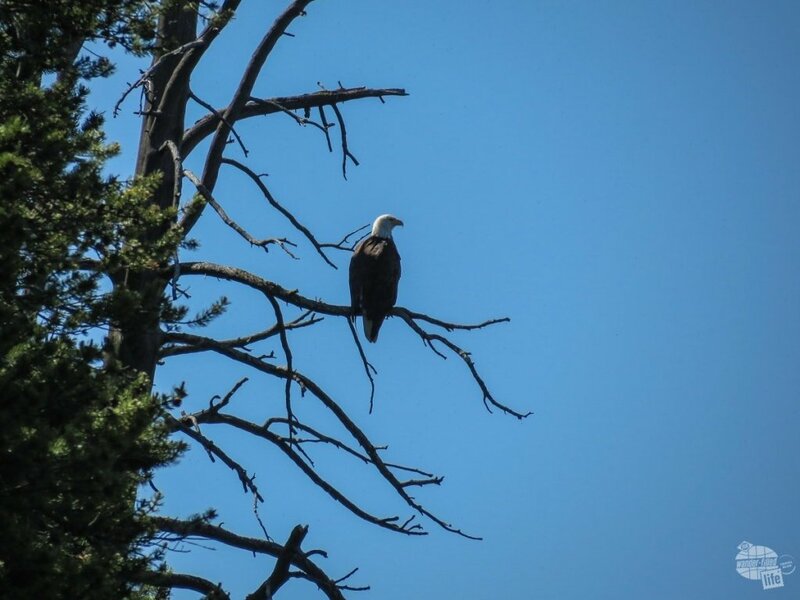 saw a bald eagle at the lake. We went to Old Faithful after lunch, hoping to catch some cell phone signal, which we kinda got, but not really. We headed across to Canyon Village and remarked about not seeing any critters. It was a bit more than 80 degrees but that is really hot for the critters here. It’s often hard to find critters out in the heat. 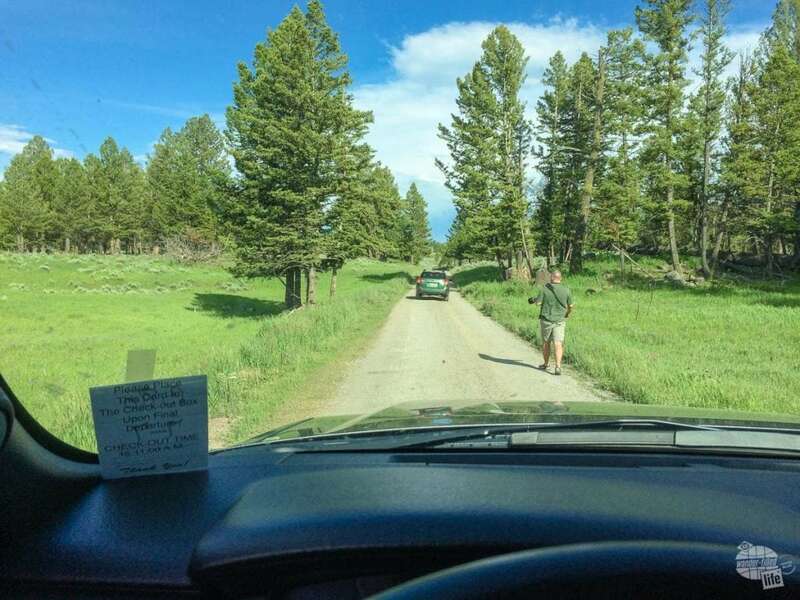 When driving in Yellowstone, you must remember that animals often cause traffic jams. Half the time, we don’t stop because it is for a bison or female elk, which are extremely common. But this one was for a grizzly bear! Grant, of course, jumped right out to take pictures. A grizzly cooling off in the creek on a hot day. We knew to expect some cold nights while we were in this area of the country, and we’ve had several since we’ve been in western Nebraska and Wyoming. In fact, we had to buy a blanket a few days ago because we forgot to pack one (we just had the sleeping bag). Last night, however, was definitely the coldest night yet. We had to get up in the middle of the night for socks and extra layers, and today bought even heavier layers. After we thawed ourselves out and got moving we had quite an interesting morning. We stumbled upon two black bears in a forested meadow. As I parked the truck, Grant started enjoying the action and taking pictures. One bear chased another up a tree, then broke limbs to make it harder for the bear to get down. Not long after, a third bear came into the scene. The bear in the tree just watched, along with a bunch of humans, to see what was going to happen with these two, which wasn’t much. Bear two (the chaser) eventually left. 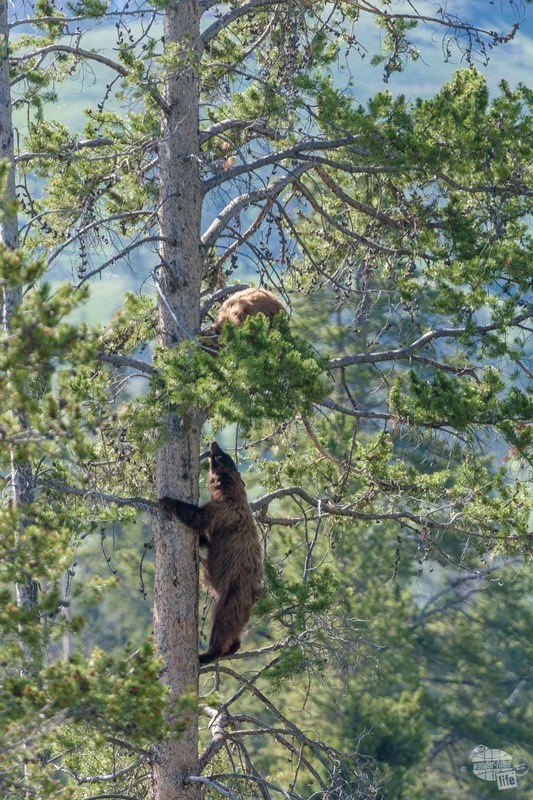 The lower bear treed a smaller female bear after attempting to mate with her. Then bear number three managed to coax bear one out of the tree. Up to this point, we thought all three bears were male. Well, at this point it became apparent that bear one was a female and bear three wanted to mate! Things almost got steamy, but the female decided to play hard to get and walked away. Of course, once the male gave up, she started pursuing him. They wandered back into the trees, and that was the end of the show for us. Grant hopes the male got some action. I am glad that if he did, they had some privacy! The male, after successfully running off a smaller male and getting her out of the tree, wastes no time in trying to mate with the female. Of course, I missed the best part of this show (bear coming out of tree & almost mating) because of my ridiculously small bladder. If only these bears could have chosen a spot near a bathroom for all this to unfold! From there, we finally made it to our hiking location for the day: Trout Lake. It was a short hike uphill to a lake/stream where trout spawn. We saw a few trout trying to swim upstream. They weren’t making much progress, but it was still cool to see! On the way back, we passed another black bear. We didn’t get any pictures of that one. It was on the move and seemed to be trying to get away from all the onlookers. We then passed another bear fairly close to where we saw the three this morning. It might have been one of those three or it could have been a fourth. We’re really not sure! After that was a Buffalo Jam. Passing the bison on the way up to Dunraven Pass. 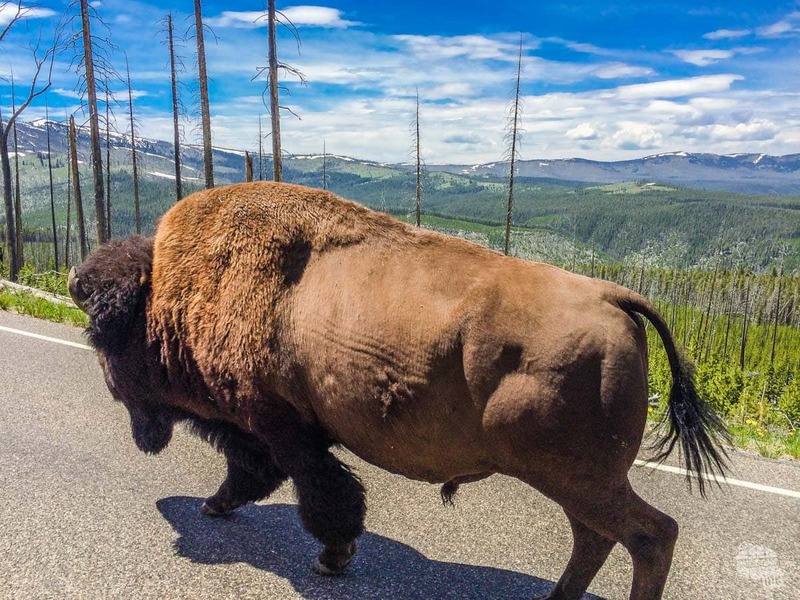 A bison decided that he wanted to walk on the road over Dunraven Pass, so he did! There ended up being a huge backup because no one could get around him. He was courteous enough to step off into the pullout as he walked by and let a few cars pass, but then he was right back in the road causing delays! Eventually, he zig zagged side to side enough for us to get past, which was good because it was way past our usual lunch time and we were losing patience! After lunch, we did a little shopping, relaxed a little, took showers and charged the camera batteries. For a few minutes Grant couldn’t find the charger. That was stressful. We thought we had rented a nice, expensive lens, only to leave the camera charger at home. But, eventually we found it in a random pocket of a relatively new camera bag. Crisis averted! After dinner, we decided to drive a bit more because evenings are always a good time for wildlife. 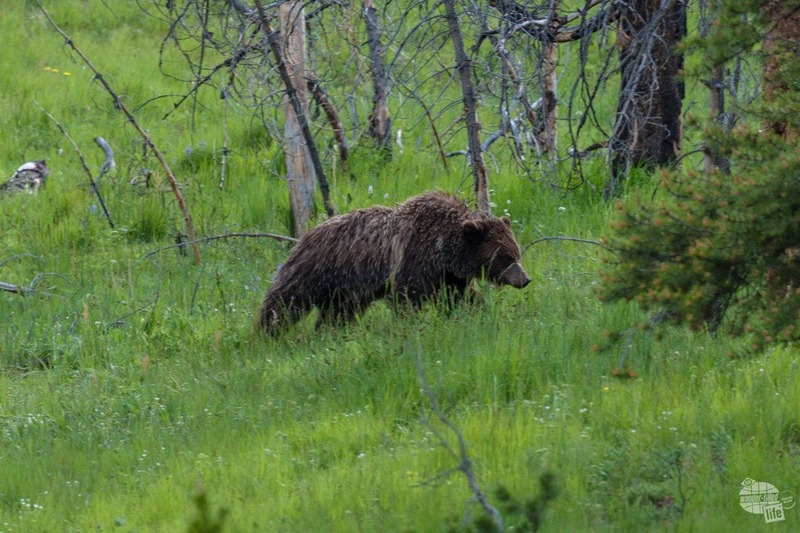 We are glad we did because we happened upon a grizzly bear! It was obviously looking for insects or mice or something tasty near the riverbed. We had fun watching it roam for a while! 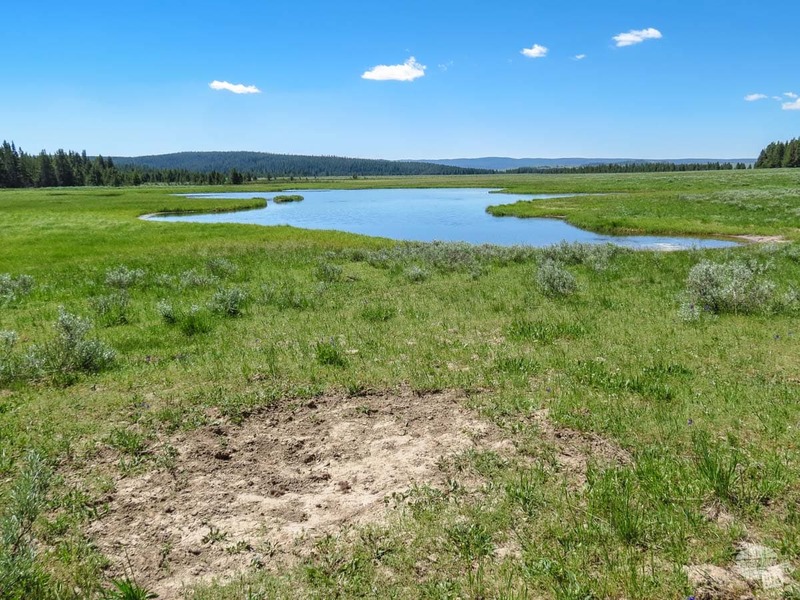 A little farther up the road, we stopped to see the Grand Canyon of the Yellowstone, and along with some great views, we saw an Osprey nest with several baby birds and mom. On the way back, there was one last surprise for the day…an otter! Grant got a few pictures. Bonnie was parking the car, of course! All in all, it was a fabulous day. We certainly never thought we would see so many bears in one day and other interesting critters too! Looking forward to one more day in Yellowstone! Today, was our last day in Yellowstone. We did a six-mile hike that went through a thermal area (steam vents mostly and a couple of mud pots), forest, meadow, and by several lakes. Other than the thermal features, there wasn’t anything too exciting about the hike, but it was a nice hike! After lunch, we set our camp chairs out by the lake and spent the afternoon reading and relaxing. It was a much needed break! Showers, dinner, and another drive this evening finished out the day. 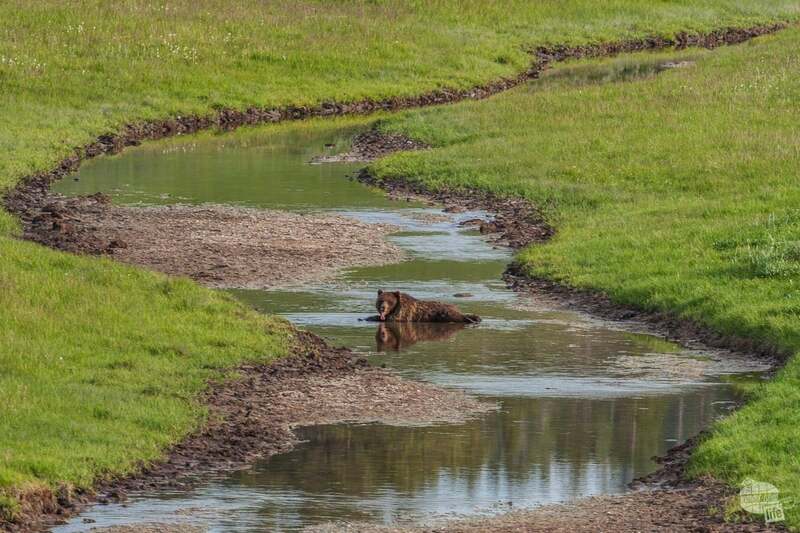 We didn’t see any exciting wildlife other a bison swimming the Yellowstone River, a weasel on the trail this morning and a bison herd hanging out right by the road most of the day, causing some minor traffic issues. For more on visiting Yellowstone, be sure to check out our articles on the Old West Cookout at Roosevelt Lodge, Grant’s tips on finding and photographing wildlife, three more great hikes in Yellowstone and our top tips for making the most out of your Yellowstone visit. This morning, we left Yellowstone National Park and headed south to Grand Teton National Park. The road between the parks is the John D. Rockefeller, Jr. Memorial Parkway, so that technically counts as another NPS site for us! After setting up camp, we drove into Jackson for some supplies and were finally able to get some cell service! It’s really kind of frightening how difficult it is to be without cell service or Wi-Fi for several days! 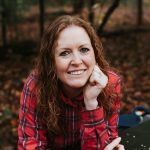 It’s not just Facebook and e-mails that we miss: it’s news, weather, and the ability to look up information and plan the next part of our trip that we want/need as well. So, we found a brewpub and got our internet fix this afternoon! We didn’t do a lot in the park today, mainly just checked out the visitor centers and picked up information to plan our hikes for tomorrow. 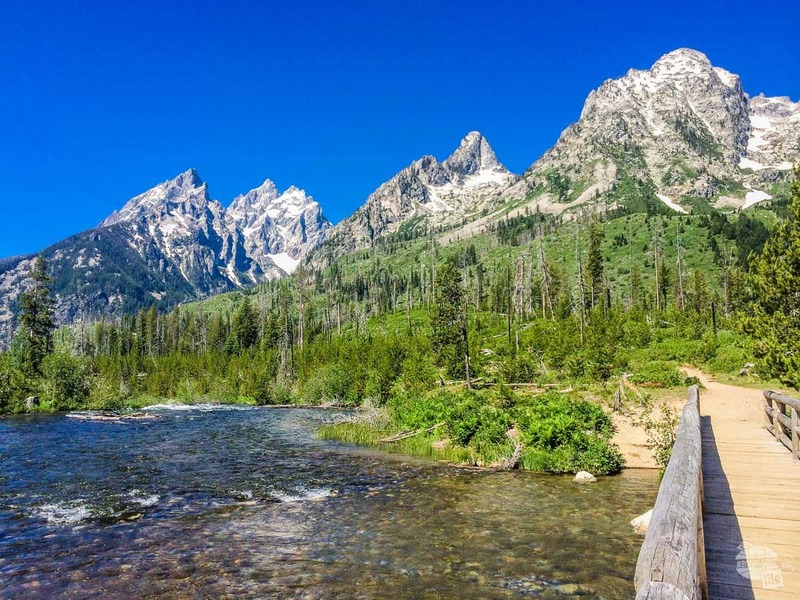 Grand Teton NP doesn’t have the same range of geological features or as much wildlife as Yellowstone NP, but the landscapes are still magnificent! The mountains shoot up from the valley without any foothills, making them seem taller than they really are. Grant enjoys the fact the name comes from French trappers who thought the mountains resembled breasts! 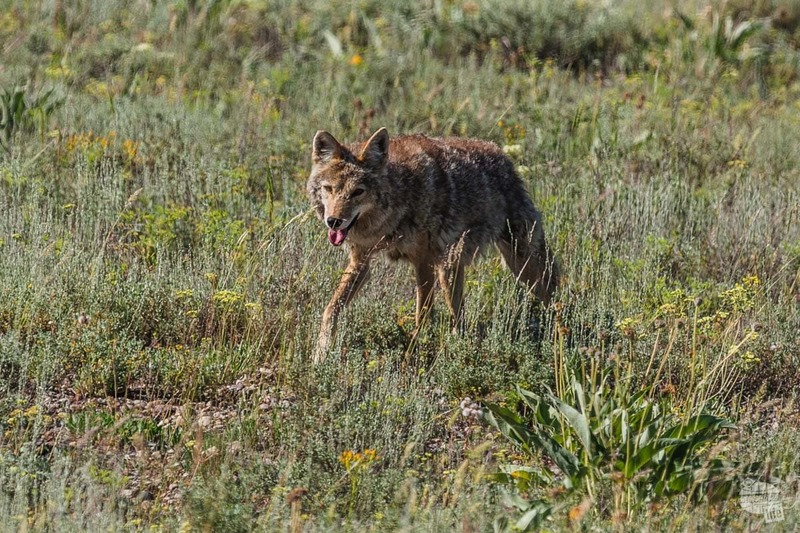 A coyote hunting for a snack. 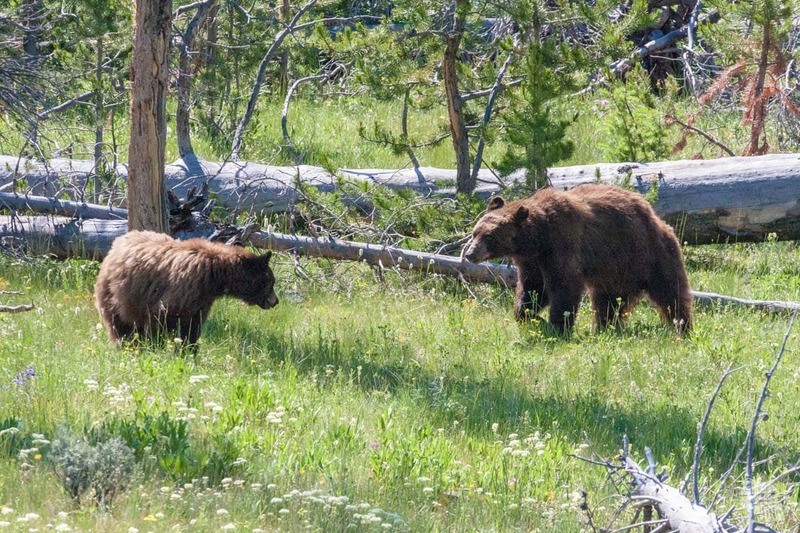 In terms of wildlife, you can see most of the same animals as Yellowstone, they just aren’t as common. We did see a coyote today. We were told that there is a fox den right at the entrance to our campground, so maybe we’ll see them (the kits like to play in the road). There is also has been a bull moose spotted not far from our campground. We went looking for it tonight but no luck. Oh well, we have two more days! We have tent camped in Grand Teton NP twice, both times in Colter Bay Campground. What a difference from Bridge Bay in Yellowstone! This campground was well done, had a level tent pad and was quiet. 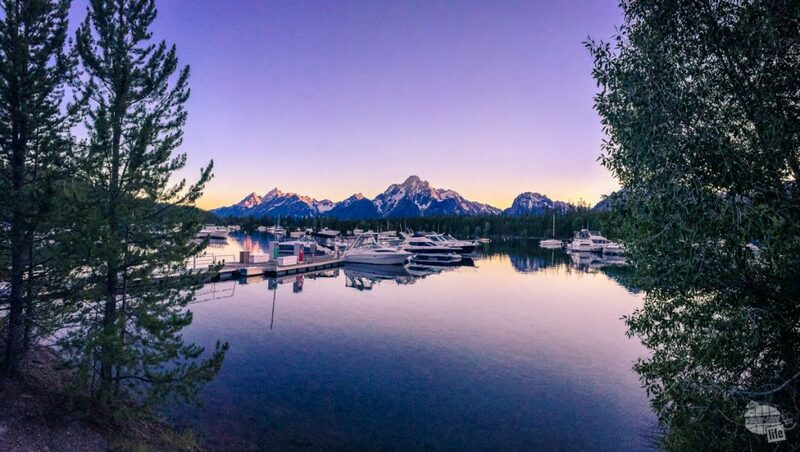 We were really pleased with how well the Grand Teton Lodge Company maintains this campground. 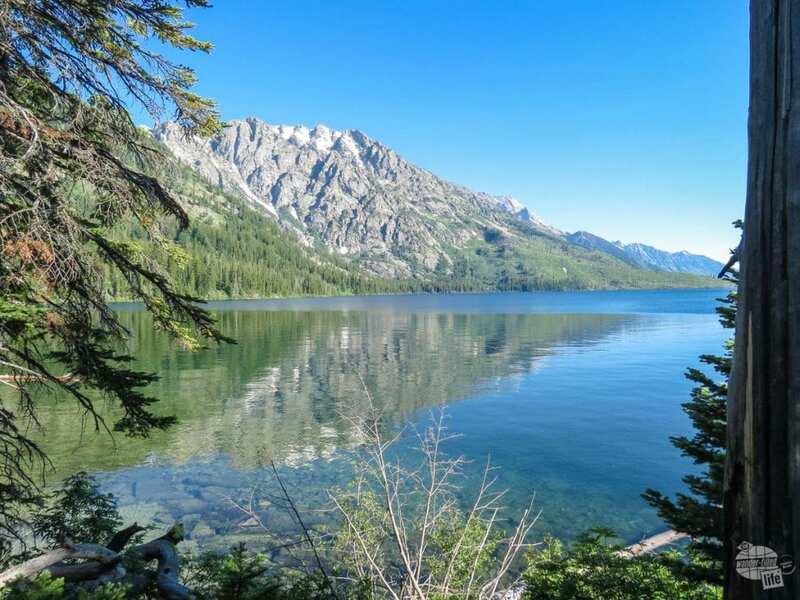 This morning we went to the most popular part of Grand Teton NP: Jenny Lake. The last time we visited this park (five years ago) we came to this area in the middle of the day and discovered all the guidebooks were right: the parking lot was overflowing. So, we skipped it. We’ve also read that it’s busy for a reason; it’s a great location with spectacular views, so we knew we had to make it a priority this time! So, we arrived early and had no problems parking. We decided to do the complete hike around the lake plus a couple of offshoots to views and waterfalls on the opposite side. We ended up doing at least eight miles! Our feet were screaming by the time we finished, but it was definitely worth it. There is a shuttle boat that many people take across the lake to see the waterfalls and get to other trails, so that area was busy, but the rest of the trail was peaceful. We can’t begin to count how many times we looked up and said, “Wow!” One thing for sure is that the views don’t get old! 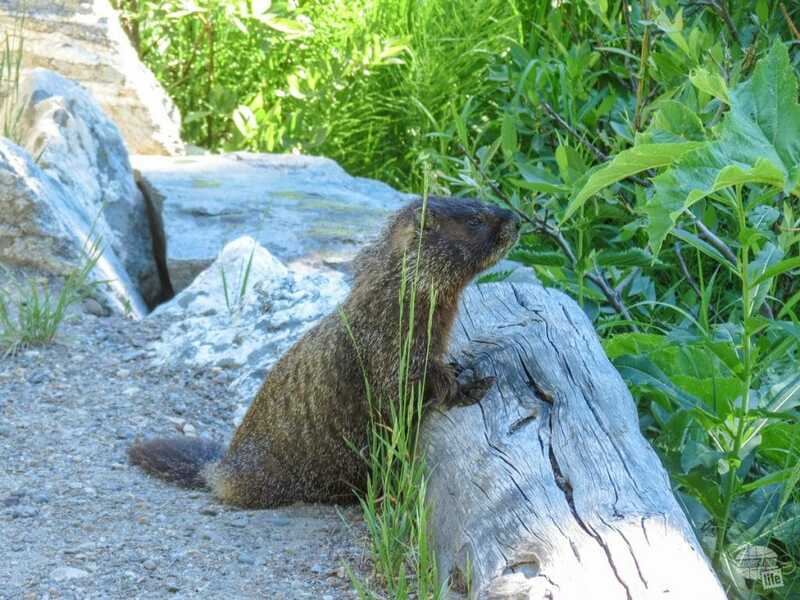 We met the world’s friendliest marmot along the Jenny Lake Loop. Other than amazing views, we didn’t see too much else on the trail. The only wildlife, other than squirrels/chipmunks was a marmot chowing down on some sort of animal poop. I guess it was tasty for him because he/she seemed to be enjoying it. Of course, after that long on the trail, we were exhausted! The rest of the day was spent reading and relaxing at the campsite. Originally, the plan was to stay here again tomorrow and do some more hiking but we’ve decided that we’re going to leave tomorrow and move on to Fossil Butte in hopes of having a relaxing day on July 10th, which is our anniversary. We realized yesterday that after 10 nights in a tent on an air mattress (and two nights on a dorm mattress before that), we were more than ready for a hotel! 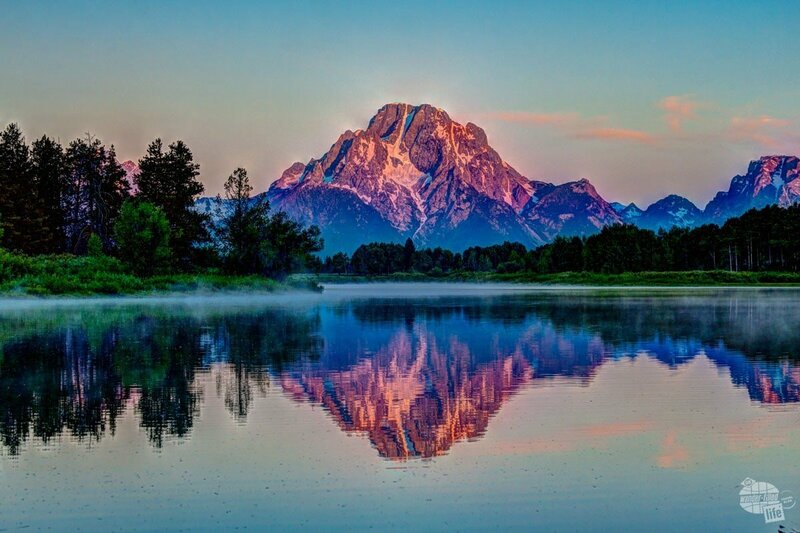 We decided to leave Grand Teton a day early from our original plan and head south towards Colorado. We got up early for Grant to take some sunrise pictures of the Tetons, then broke camp and went to Fossil Butte National Monument. 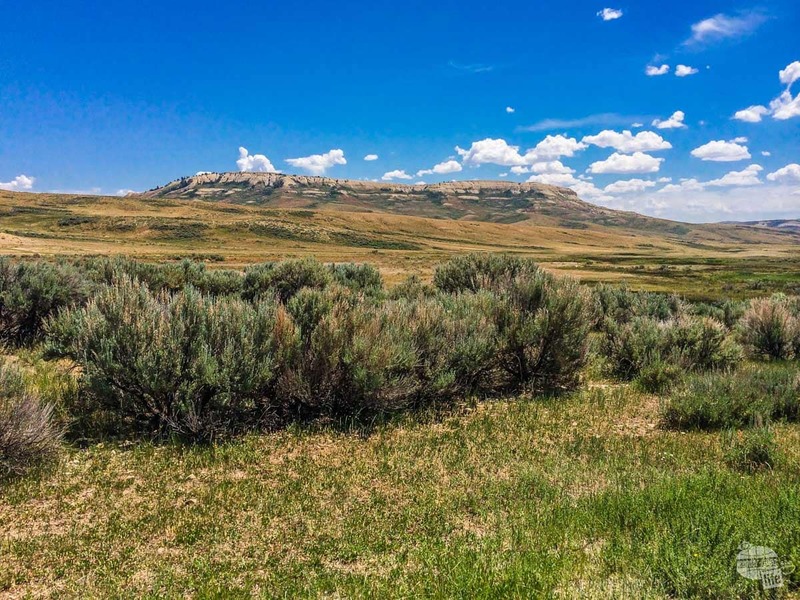 Fossil Butte has some of the world’s best preserved fossils of fish, plants, and insects. There isn’t much to the site other than the visitor center and a couple of trails through sagebrush (meaning no shade) so it was a quick stop. From there, we ended up at the Hampton Inn in Evanston, WY (in the southeast corner of the state, three miles from the Utah border). There is absolutely nothing exciting about this town other than it has a Hampton Inn with rooms! The highlight of our afternoon was taking showers. We’ve only had 5 showers in the past 10 days. The other big excitement was relaxing on an actual bed in an air-conditioned room! The best part? We are going to do this again tomorrow…just relax! 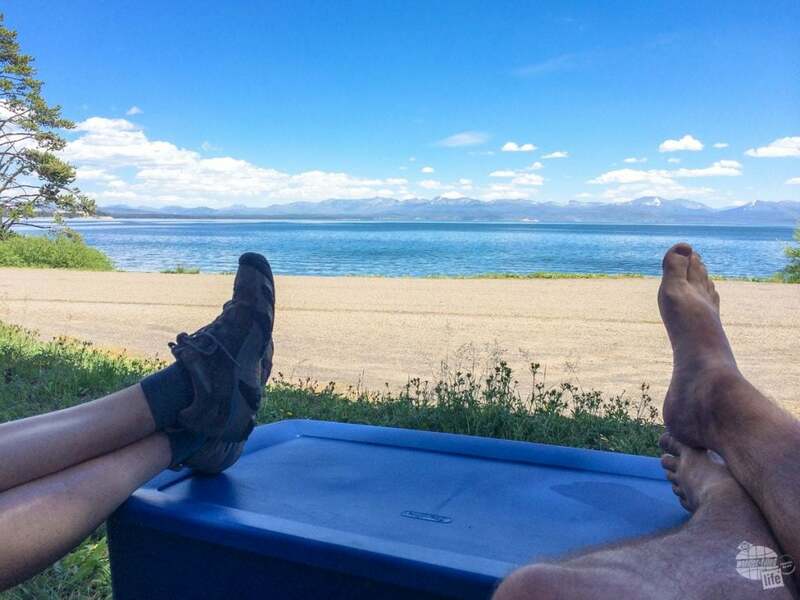 Relaxing on the shores of Yellowstone Lake. We really enjoy camping, but this stretch has been the longest stretch we’ve done without a hotel and it’s been pretty brutal, especially since four of those nights were in an awful campground. We have slowly realized how much we want to get a travel trailer sooner rather than later. I guess we are getting old. Dinner for our anniversary was actually was pretty good. The restaurant was the Bon Rico Supper Club. We got a ton of food, which was all pretty good, for a great price. We each ordered a steak – NY Strip for Grant, Filet Mignon for Bonnie. With that we got a relish tray (fresh & pickled veggies), soup, salad, bread, steaks, baked potatoes, and a small dessert, all for a usual steak price ($20-$25 each). All of the food was good, nothing too exceptional, but good. The portions were huge… 16 oz for both steaks! And drinks (beer and wine) were included! While we certainly have no reason to want to come back to Evanston, it was a great layover and provided us with a relaxing day!